Gut health is increasingly seen as connected to major depressive disorder (MDD) and a simple test could one day provide much better outcomes for millions of sufferers of this debilitating and costly condition. Professor Julio Licinio and Professor Ma-Li Wong at the SA Health and Medical Research Institute in Adelaide. Flinders University Professor Julio Licinio, who leads the Mind and Brain Theme at the South Australian Health and Medical Research Institute (SAHMRI), with other South Australian and research collaborators overseas, are closing in on a range of better treatments in this complex area of health. “Antidepressant drugs not only have side-effects which cause other health problems, but they also might not be the best solution for the mental health conditions they’re prescribed to treat,” says Professor Licinio, Matthew Flinders Strategic Professor of Psychiatry at Flinders University. “A growing pool of evidence is pointing to the balance of the gut microbiome having a strong bearing on the underlying pathophysiology of major depressive disorder,” says Professor Licinio, pointing to the latest research in Molecular Psychiatry. Using animal models of chronic stress and depression, Professor Licinio’s team has noted specific changes in the gut microbiome that are regulated by inflammatory mediators. Professor Licinio says further work should test whether it is possible to treat MDD patients by balancing their microbiota-gut-brain axis with supplementary gut micro-organism – and even to develop a simple test for depression from a stool sample. This could one day lead to a personalised strategy for treatment that is tailored to individuals’ microbiota or inflammasome makeup – possibly in the next 5-10 years. MDD affects up to 350 million people, with the World Health Organization rating it the leading cause of disability in Australia and other developed and one of the biggest healthcare costs worldwide. Depression doubles the risk of coronary heart disease, increases the risk of diabetes by up to 60%, and is associated with obesity. The definitive root causes remain elusive but a range of gene-environment interactions are involved. “In related work, our Chinese collaborators at Chongqing Medical University led by Professor Peng Xie have found that the gut microbiota compositions of MDD patients are significantly different to healthy patients,” says Professor Licinio. “Importantly, they showed that if you transfer the gut microbiota from depressed patients to germ-free mice, they behave in a way that resembles depression. Although there are a host of symptoms common to MDD (mood changes, lethargy, loss of interest etc.) these symptoms are common to many physical and / or mental disorders. Depression often goes undiagnosed and can lead to suicide. Professor Licinio is conducting the MDD research with Flinders Professor Ma-Li Wong – also Head, Pharmacogenomics Research Program within SAHMRI’s Mind and Brain Theme – Associate Professor Geraint Rogers, who is also Director of Microbiome Research within SAHMRI’s Infection and Immunity Theme; and SAHMRI’s Executive Director, Professor Steve Wesselingh (who is also the Institute’s Infection and Immunity Theme Leader). Based at SAHMRI in Adelaide, Professor Licinio and Professor Wong are leading a number of Mind and Brain research projects, including better outcomes for antidepressant treatments, genetic links and links between depression and obesity. “Many people don’t make the connection between these two areas (depression and obesity), including health professionals who tend to treat one or the other – and as a result, these two areas tend to be understudied,” he says in The Investigator Transformed, a Flinders University 50th Anniversary publication. “Our biggest project is looking at how some people respond very well to antidepressants and others don’t, and trying to understand the genetic reasons for that. Working together at SAHMRI and Flinders University, Professors Licinio and Wong are on a mission to show international researchers how important the nexus between obesity and depression is. “We are in the midst of an obesity and depression epidemic,” Professor Wong says. “The rate of people on antidepressants has skyrocketed. They are two important topics that don’t operate in isolation, and we hope to be able to create the grass roots shift towards holistic management of both,” she says. An extensive collection of profiles on Flinders University leaders, students, graduates, researchers, academics and supporters can be viewed online at the Flinders 50th Anniversary website here. 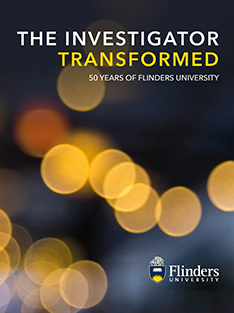 The souvenir picture book, The Investigator Transformed, can be purchased via the Flinders 50th Anniversary website. Gut microbiome remodeling induces depressive-like behaviors through a pathway mediated by the host’s metabolism Molecular Psychiatry (2016) 21, 786–796; doi:10.1038/mp.2016.44 – click here. Inflammasome signaling affects anxiety- and depressive-like behavior and gut microbiome composition Molecular Psychiatry (2016) 21, 797–805; doi:10.1038/mp.2016.46 – click here. If you need help, contact Lifeline on 131114, Beyond Blue or other services for support.